Classic Sci-Fi: 10 things you might not know about PLANET OF THE APES | Warped Factor - Words in the Key of Geek. Geek Dave gets his stinking paws on 10 things you might not know about the original 1968 Planet of the Apes. 1. Planet of the Apes is based on the 1963 satirical novel 'La Planète des singes' by Pierre Boulle. The movie rights were obtained by producer Arthur Jacobs who hired The Twilight Zone's Rod Serling to write the screenplay. Serling introduced cold war and nuclear war themes, and came up with the concept of the famous final scene. Boulle didn't like the new proposed ending, in his novel the Taylor character (called Ulysse) leaves the planet with Nova and their child, flies back to Earth and discovers it being ruled by apes. However, when the movie was pitched to Charlton Heston, he loved Serling's new ending. That sealed it. 2. The movie was repeatedly pitched to all the major studios, but no-one was interested in making it. 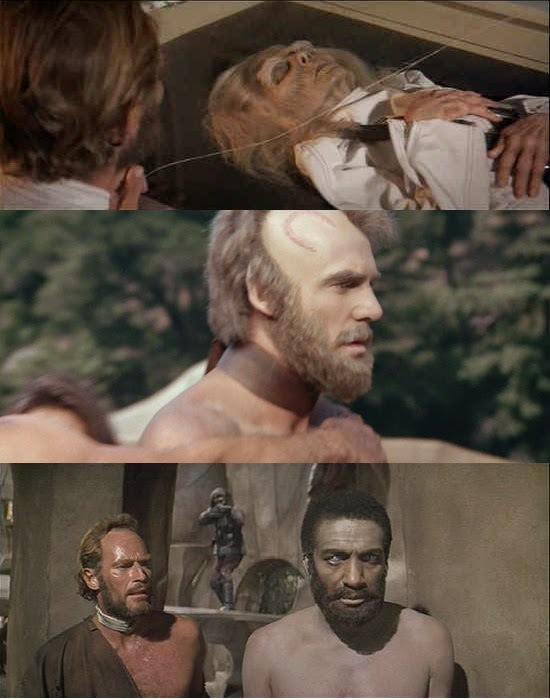 Finally the then head of 20th Century Fox, Richard Zanuck, agreed to finance a make-up test to see if talking apes could be taken seriously, which seemed to be the main concern for all the studios. 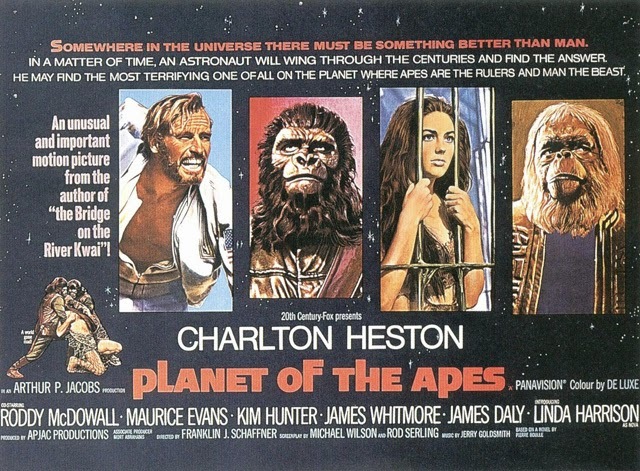 On March 8th 1966 the test was filmed with Heston, Edward G. Robinson as Dr. Zaius, James Brolin as Cornelius and Linda Harrison as Zira. The former Miss Maryland, Linda Harrison was romatically linked to Zanuck at the time, and it was he who bought her in for the make-up test. However she had to later audition for director Franklin J Schaffner to get the part of Nova. Though the make-up test was considered successful, 20th Century Fox didn't initially green light the project, until the movie Fantastic Voyage was released and became a huge success. Jacobs petitioned real hard, with the argument that science fiction was the big thing right now and they needed to move on this project quickly. And they did. 3. Serling's script was quickly deemed too expensive to film, so Michael Wilson (It's a Wonderful Life, The Bridge on the River Kwai) was brought in to perform a rewrite. Wilson had been blacklisted during the McCarthy era and so during that time he wrote scripts under the pen name of John Michael. When The Bridge on the River Kwai was nominated for and won the Academy Award for Best Adapted Screenplay, Pierre Boulle (who wrote the novel) received the award. It wasn't until after Wilson's death that he was posthumously awarded the Oscar in 1984. 4. 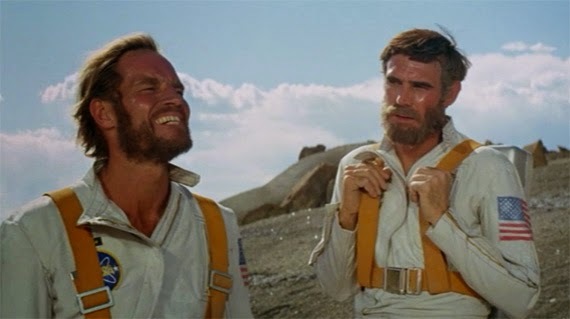 Charlton Heston came up with the idea for the crew to have beards, because he felt hair would continue to grow while they were in suspended animation. 5. None of Taylor's fellow astronauts survived the movie. In real life Jeff Burton (Dodge) was a Los Angeles probation officer who'd acted in several television shows. Robert Gunner (Landon) only appeared in a handful of films and television, and Planet of the Apes proved to be his last film. The third astronaut, Stewart, was written as a male character but was actually portrayed on screen by Dianne Stanley, an elderly woman made up to look dead. 6. Of course, it was the amazing ape prosthetics that really helped to make this movie so popular, but they didn't come cheap! If you adjust for inflation, Planet of the Apes still holds the world record for the highest make-up budget (then £345,542), which represented about 17% of the total budget (£2 million). 7. It was Roddy McDowall who recommended to his fellow ape actors that they should frequently add tics, blinks and assorted facial gestures to add a sense of realism and keep the makeup from appearing "mask-like". McDowall reportedly loved being in character so much during the early part of the shoot that he would leave the ape make-up on and drive home, starring out his car window to shock the other drivers on the freeway. 8. Not everyone was so keen on the facial prosthetic though. Kim Hunter (Zira) reportedly found it so claustrophobic that she resorted to taken a Valium each morning before the make-up was applied. 9. All the Ape actors and extras were required to wear their masks even during breaks and in between shots because it took so much time to make them up. Because of this, meals were liquefied and drunk through straws. During their breaks the actors made up as different ape species tended to hang out together, gorillas with gorillas, orangutans with orangutans, chimps with chimps. It wasn't required, it just naturally happened. 10. In the hope of getting some free positive publicity for the movie, Arthur Jacobs enlisted several journalists to play apes, including Variety columnist Army Archerd. It worked. Taking $26million on initial release in the US alone, and spawning one hell of a legacy - 4 sequels, a TV show, an animated series, comic books and 2 remakes. But for me, none of them have matched the original Planet of the Apes.